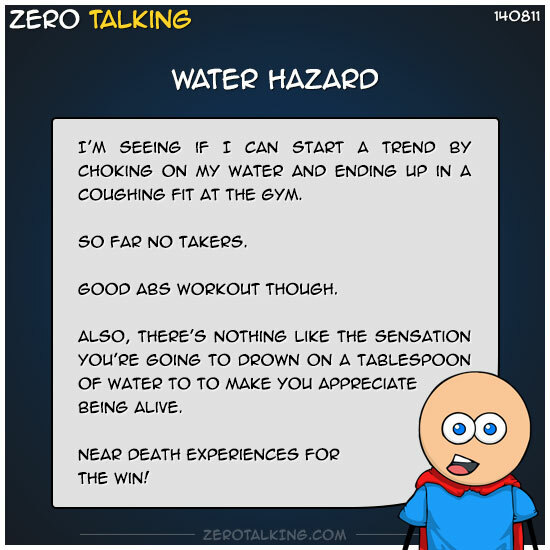 Seeing if I can start a trend by choking on my water and ending up in a coughing fit at the gym. Also, there’s nothing like the sensation you’re going to drown on a tablespoon of water to make you appreciate being alive. Near death experiences for the win! Melinda: Air goes in trachea. Water goes in esophagus. Learn it, know it, live it. Barbara: I hate it when that happens – and being an older lady – people automatically suspect I am going to die! It is pretty funny.